G T Thunder - Technology on the move!! Complete 50mm Big Bore Kit. Comes complete ready to install. Includes: New longer heavy duty swingarm - long travel, and a new Elite Rear Shock. Front brake cables - $75.00 per pair. 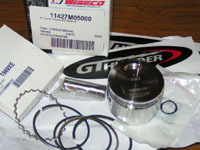 125 Big bore kit exchange - $550.00 - Cases need machined for this.